Darien's Erika Osherow is greeted by teammates led by Brittany Osborn, center, as she brings in a homer as Darien High School hosts Stamford High in a softball game in Darien, Conn., May 10, 2012. 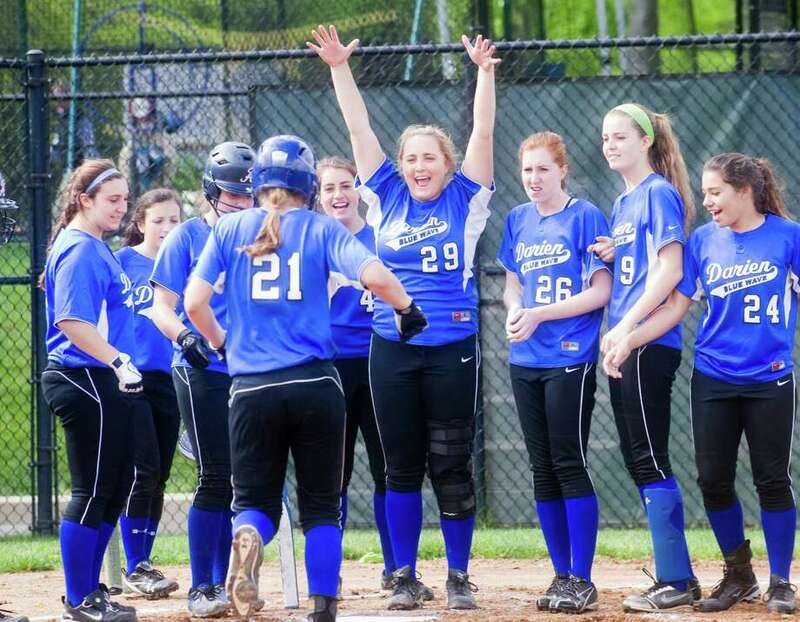 DARIEN -- It would appear a team riding a 13-2 record would have few areas for improvement, but Darien High softball coach Nick DeMaio said his team could use to flash its killer instinct from the outset of games. Erika Osherow, the Blue Wave's freshman sensation, appeared to take care of that problem Thursday afternoon, leading off the bottom of the first inning against Stamford with a home run over the leftfield fence. But it wasn't until the middle of the game that Darien hit its stride, erupting for a total of nine runs in the fourth and fifth innings that led to a convincing 11-1 victory. "Sometimes we take a little while to get started, but we have been putting up the numbers pretty consistently," DeMaio said. "Erika's home run was big. When you are playing a quality team like Stamford, it can be a one-run game. Sometimes that's all it takes, though not today." The Blue Wave have now scored eight or more runs in 10 of their wins, a virtual knockout blow with senior ace Jessica DeMaio on the mound. "Erika's home run got us started. Sometimes the first run is the hardest," said Darien's Courtney Bell, nearly echoing her coach. "Hitting becomes pretty contagious for us." Osherow, the leadoff hitter who has been earning rave reviews in her first season, went 2-for-2 and walked three times, scoring three runs and driving in two. "I knew she was capable of this," Nick DeMaio said of Osherow, who has stood up to the pressure of taking over at shortstop for Nicole Buch, one of the best players in Darien's history. "Watching her in the preseason I knew she would make an impact." Osherow, who now has three home runs, was not even the Blue Wave's hitting star of the day. That distinction went to DeMaio, who complemented her four-hitter with two hits, including a three-run home in the fifth that hit off and went over the top of the centerfield fence. Olivia Gozdz added two hits and two RBIs, while Bell and Emma Hamilton each had two hits and drove in a run. Darien finished with 12 hits and took advantage of eight walks. Bell credited the team's consistent offensive performance to Art DeFillippis, the hitting coach who was a former Stamford baseball star and long-time assistant to Tony Esposito, the Black Knights' softball coach. "We've been working on hitting a lot during practice," Bell said. "Artie really works with us, and we like to make him proud." The loss was a setback for Stamford (10-4, 9-4 FCIAC), which was riding a four-game winning streak and came into the day with the sixth-best record in the league standings. The game started positively enough: Krista Robustelli, in the midst of a sensational season, hit a soft single to centerfield on a changeup, stole second and eventually scored on a well-executed suicide squeeze by Tori Hynd, who reached on an error. But Stamford would manage just three hits the rest of the way, including a long double by Robustelli and singles from Hynd and Karly Lyons. "I'm displeased," Esposito said. "We expect better. You want to come here and see what you can do, play hard, and we didn't bring it. That's disappointing." Asked if he thought his team, after a slow start, was still in a position of trying to validate itself as one of the conference's top teams, Esposito said, "I thought we were beyond it. The big inning has cost us all year. Now we have to turn the page." The next one is not any easier: the Black Knights have to face another contender, St. Joseph, at home on Saturday morning. "We have to step up," Esposito said. "Four straight games does not make a season and this game does not make a season. There are a lot of big games left. But we have a lot of work to do." Darien also picked up a 13-0 win over Fairfield Warde last Friday and a 16-0 win at Bassick on Monday to improve to 16-2 overall. Darien, which has already clinched a spot in the FCIAC playoffs, finishes the regular season with a trip to Fairfield Ludlowe today at 3 p.m. and a home game against Norwalk on Saturday at 1 p.m. Batteries: S-- Christina Joannou (L), Jordan Schepps (4) and Colleen Adams. D--Jessica DeMaio (W) and Olivia Gozdz. Doubles: S--Krista Robustelli; D--Gozdz. Home runs: D--Erika Osherow, DeMaio.